We live in a culture of consumption that is wasteful in its use of resources, which in turn feeds growth of solid waste and greenhouse gas emissions. The phrase “reduce-reuse-recycle” is common, but too often we focus on recycling of materials and we neglect to reduce our consumption or reuse products. 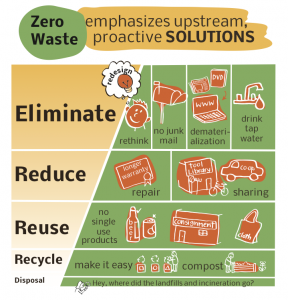 Zero waste policies aim to dramatically reduce the volume of materials that flow through the economy, leading to better environmental outcomes and new green jobs in BC. This module draws on the Climate Justice Project report, Closing the Loop: Reducing Greenhouse Gas Emissions Through Zero Waste in BC. Students will connect the concept of waste to consumption actions. Students will understand the difference between open and closed loop systems. Students will use the “eliminate-reduce-reuse-recycle” frame to redesign or replace wasteful products. Students will rethink how their school and community could deal with waste. READ ALOUD: Today’s topic is rethinking waste. ACTIVITY OPTION 1: In groups of four, ask students to create a list of items they throw out (whether in garbage or in recycling/composting) on a regular basis. ACTIVITY OPTION 2: Ask students to keep a diary of everything they throw out (whether in garbage or in recycling/composting) over a 24-hour period. Then, as a class, make a master list, grouping items into categories (e.g. organic matter, plastic, etc.). Note: you will need to keep the master list for an activity in Part 3. How many of these items were purposely designed by humans to be thrown away (e.g. packaging, paper cups, etc.)? What else in our home or school is “designed for the dump”? What items do we recycle? How long are these items used before they are recycled? Note: Students may also notice that some recyclable items end up in the garbage. For example, only a small percentage of plastics are actually recycled – the rest goes into landfills or is incinerated. What happens to our stuff after we throw it away? Traditional “solutions” include landfills or incineration. Also, recycling and composting programs have become widespread over the past few decades. Some governments are proposing increased incineration instead of landfilling. However, incineration does not make trash disappear – it releases toxic chemicals and GHGs into the air, and produces toxic ash, which must be landfilled. Important note: the energy that went into extracting materials and transforming them into a product is lost when that product becomes waste. Organic materials that go to landfill do not decompose in the same way as if they were composted, and they release methane, a very powerful greenhouse gas. About 40% of food in Canada is wasted. About 25% is thrown out at home, and the rest is lost in production or transport. Reflect on who makes the products we consume. Are they Canadian or overseas workers? How do their wages and working conditions affect the price of goods we consume? SHOW POWERPOINT SLIDE: “Zero waste policies” in the Rethinking Waste PowerPoint. 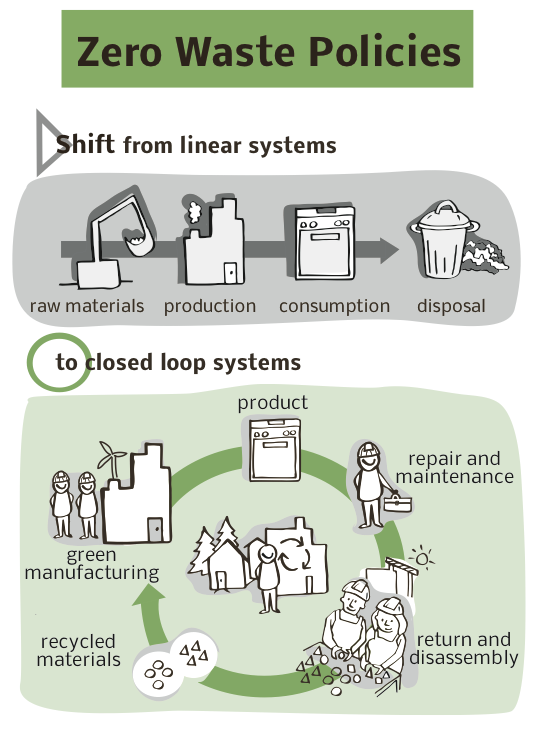 QUESTION: What is a closed loop? Is nature a closed loop? Explain. READ ALOUD: BC has a resource-based economy: we extract and export resources to the rest of the world, while importing many manufactured goods, and we also export a lot of the materials we collect through recycling programs. Shifting to an economy that recovers and reuses resources can create new economic opportunities. 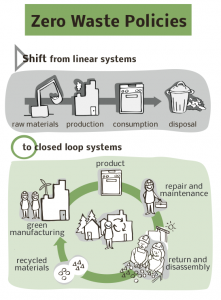 By adopting closed loop systems, what kind of green jobs could be created in BC? Green manufacturing, repair and maintenance, return and disassembly, recycling, etc. What factors are required to ensure that these green jobs would be good jobs? Well-paid work; decent working conditions; health and safety on the job. Unionization has traditionally helped to raise standards on all of these fronts. 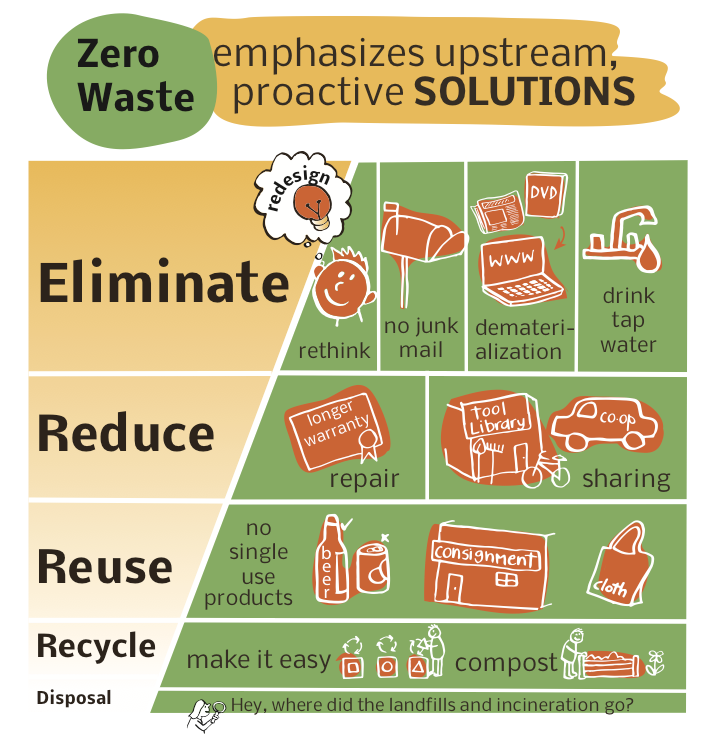 SHOW POWERPOINT SLIDE: “Zero waste emphasizes upstream, proactive solutions” in the Rethinking Waste PowerPoint. Ask students to discuss the “eliminate-reduce-reuse-recycle” image in partners, then debrief as a class. What do you see? 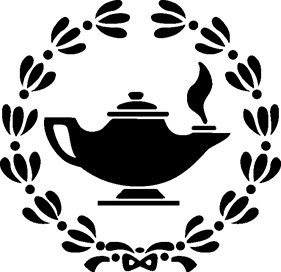 What do these images mean? How would some of these actions make things better for both people and the environment? Why is recycling the least important of the three Rs? The recycling process requires a lot of energy and we often don’t get back what we put in. For example, a recycled plastic bottle is actually “downcycled” ­– it is melted down using energy, and turned into lower-quality products. Did you know… a beer bottle is reused up to 15 times before it is recycled! Looking at this image, what do you already do? Is there anything here you would like to start doing? How can we implement these changes at our school? In our community? Action example: Youth4Tap – high school students take action to eliminate plastic water bottles at their schools. See Module 8: Challenges to Change for more information. READ ALOUD: Let’s look back at what we put in the garbage, and see how we can reimagine our waste systems. Break into groups of four. Ask each group to choose four human-made waste products from the garbage list (created in Part 1). Question for the group to consider: How would you redesign each product so the waste is eliminated? This could involve changing the materials in the product, creating a way for the product to be reused, or changing the broader systems involved. Ask each group to report back to the class. What were the easiest waste products to eliminate? Were there some items that could not be eliminated? How challenging would it be to implement your redesign ideas? Why? Do governments or other groups have a role to play in getting people to reduce waste, or should it be left to individual choice? Why? Create an initiative at your school or in your community to reduce or eliminate waste. Research how to create a home compost system, and make one.